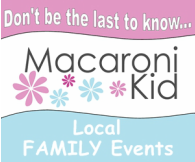 Macaroni Kid is a weekly e-mail newsletter of LOCAL kid-friendly and family events and activities. We are proud to be the most comprehensive coverage in our respective areas. Our rapidly growing numbers tell you – families in your target area are looking at our sites to see what we have to offer. We have limited ad space = Your ad will not be lost among hundreds of other businesses. Our readers have self-subscribed as active families that want to know about events and activities in our community. They are YOUR audience! Your ad will reach your target market every time.